“When are you going to photograph me again?” the most adventurous one of my friends asked. It had been eighteen months since I last photographed her. Since then we’d spent hours together in emergency rooms and doctor’s offices. We’d also gone to plays and dined out in local ethnic eateries. But over the past year my friend has become more and more dependent on her wheelchair and oxygen tanks. I can’t recall when I last saw her walk more than a step or two. The oxygen tubes have become a permanent facial feature. She would no longer want to pose for pictures and then be posted all over Facebook and Twitter, I thought. And that is what I’m embarrassed to admit: I all but bought into the idea that we need to hide reality, draw the curtains on any evidence of aging or disability. My friend, joyful spirit that she is, has happily posed in the past, flapping her wings, hugging plants, pretending to hug her inner child. She simply loves being in front of a camera. And I was ready to totally dismiss that because of my own hang-ups and preconceived notions about growing old. “You have to come see what I’ve been working on,” she said, days later when I dropped her off after a gut-buster lunch at a Chinese buffet. By the time we emptied my car of the wheelchair, the pillow that accompanies the wheelchair, the bag that is supposed to stay attached to the back of the wheelchair, and the oxygen tank (which she always says is almost empty, just to get me riled) we were both exhausted. But, curious to see her new project because health issues had hampered her recent creative efforts, I followed as she wheeled herself into her doorway and pointed to the floor. “You’ve been painting on the carpet?” I asked, stepping carefully around the painted areas, and eyeing the pile of fabric markers lying nearby. Stifling the tiniest laugh, I examined her latest masterpiece, wondering how on Earth she got down-to and then up- off the floor. “I couldn’t get the stains out so I decided to paint over them,” she said, with a smile beneath the oxygen tube, full of mischief and pride. And then she showed me how. 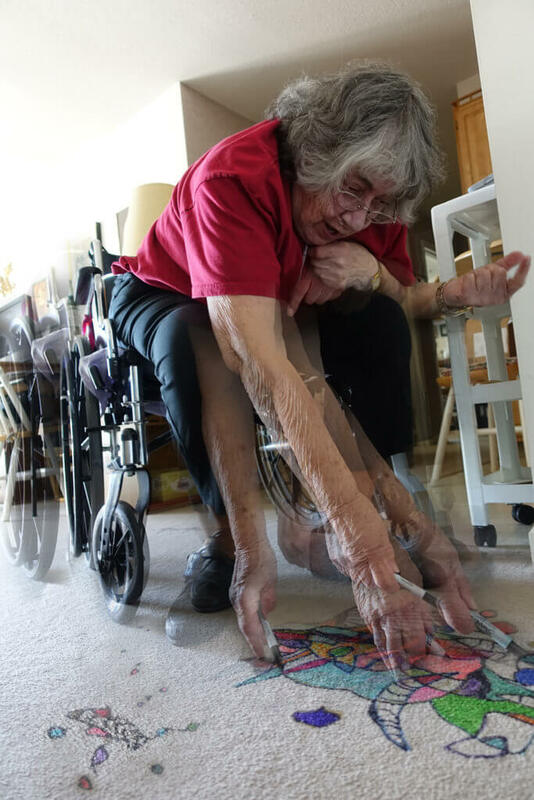 This entry was posted in 2016 and tagged aging, aging and disability, aging with joy, friends who make you laugh, hiding effects of aging, joy of friendship, loss of mobility, old friends, painting on carpet on 2016/08/15 by Robin Botie.